In "Great Expectations," Charles Dickens crafted an indelible portrait of a young man of no means whose desires to be a "gentleman" almost come true — but with tragic consequences. At its most basic level, it's a tale of personal ambitions and assimilation gone wrong. 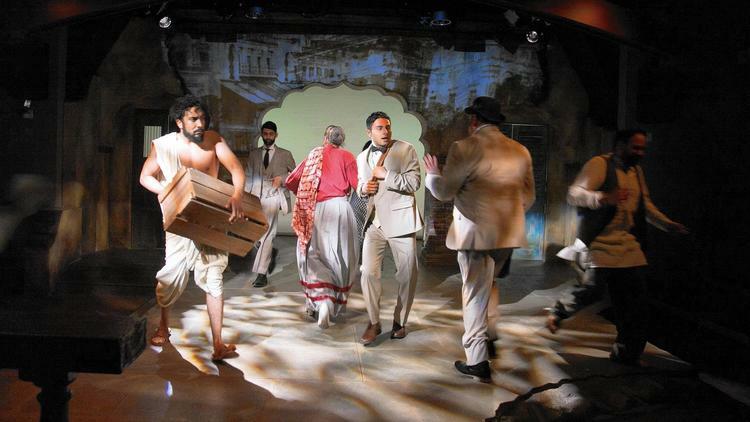 Tanika Gupta's 2011 adaptation of Dickens' novel takes Pip's journey and turns it into a metaphor for the soul of India under the Raj. It's set during the same years that Dickens wrote the novel — the early 1860s. But instead of traveling from the marshes of Kent to the urban grit of London, Gupta's Pip moves from a small Indian village not long after India's First War of Independence in 1857 to the dizzying mix of cultures in colonized Calcutta. Gupta is a celebrated British writer of Bengali descent whose great-uncle, Dinesh Chandra Gupta, was a revolutionary hanged in 1931 for his role in assassinating a British inspector-general of prisons. One can only speculate how that personal family history influenced her perspective on a story where a man convicted by the Crown plays a key role. But it's entirely clear from Remy Bumppo and Silk Road Rising's ambitious and intelligent co-production of Gupta's sprawling adaptation that Dickens grafts well in the soil of the subcontinent. Co-directed by Lavina Jadhwani and Nick Sandys, the three-hour production has its slow spots, to be sure. At times, it feels a little too faithful to the original, instead of bringing in even more details of the time and place to which Gupta has transplanted the story. On balance, though, it works quite well at enlarging the scope of Pip's existence from a personal tale of yearning and betrayal to a portrait of a colonized nation wrestling with the pressures to become more like the colonizers — in education, manners and dress. The most compelling relationship here, as in the original story, is between Pip (Anand Bhatt) and his brother-in-law, Joe Gargery (Anish Jethmalani), a cobbler who raises Pip. Despite his unlettered status, Joe sees more clearly than anyone else that there are great dangers in Pip taking money from a mysterious benefactor and going off to the city. He also sees the affectations that Pip adopts in his quest to be a gentleman. "To be sure, you are an honor to your queen and country," he tells Pip on a visit to Calcutta — and in Jethmalani's acidic reading, it's not a compliment. How far does one trust British people and British justice? That's also a compelling question underneath both Pip's journey and that of the convict, Magwitch (Robert D. Hardaway), who ends up playing a crucial role in his life. Magwitch decries the "white locusts sweeping through the land" who conquered his African home and eventually brought him to India. In that sense, Linda Gillum's Miss Havisham, whose personal heartbreak turns into a quest for vengeance on men that damages her African-Indian adopted daughter, Estella (Netta Walker) as well as Pip, might well be one of those "white locusts," even though she never leaves her home. Gillum's wraithlike appearance and her crepuscular home (captured in its cobwebby gloom through Yeaji Kim's projections and Lindsey Lyddan's shadowy lighting) stand in contrast to the sunny — if poor — world of the village outside her door. The staging here gets bogged down from time to time with cumbersome scene changes, though the musical underscoring in Ronnie Malley's original soundscape provides lively accompaniment. The dozen actors — many playing multiple roles — enliven the busy street scenes in Calcutta as country boy Pip attempts to negotiate them. Bhatt's Pip, while perhaps a tad too understated at times, moves through the character's changing circumstances with a palpable and convincing air of self-consciousness. He, like his country, is torn between loyalty to one's own culture and people and a desire for wealth and respectability as defined by outsiders. Until he knows who he is, his expectations can never be truly great.